What's behind the Rorschach inkblot test? Few devices from the world of psychology have entered popular culture quite so much as Hermann Rorschach's famous inkblot test. But the test still divides psychologists, writes Dr Mike Drayton. I first came across the Rorschach inkblot test when I was training to be a clinical psychologist. I was shown a series of cards containing inkblots and asked to say what they looked like to me (Tester: "What does this look like?" Me: "A bat.") I remember thinking that it felt more like a tarot reading than a proper psychometric test. However, when the test was scored and interpreted, it produced a scarily accurate profile of my personality. It knew things about me that even my mother didn't know. I've been a fan, if a rather sceptical one, ever since. 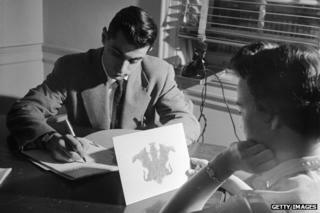 So, what is the Rorschach inkblot test? It's simply a set of cards containing pictures of inkblots that have been folded over on themselves to create a mirror image. The Rorschach is what psychologists call a projective test. The basic idea of this is that when a person is shown an ambiguous, meaningless image (ie an inkblot) the mind will work hard at imposing meaning on the image. That meaning is generated by the mind. By asking the person to tell you what they see in the inkblot, they are actually telling you about themselves, and how they project meaning on to the real world. But the inventor of the test, Hermann Rorschach, never intended it to be a test of personality. As a child, the young Hermann was a big fan of a popular game called Klecksographie, so much so that his nickname was Kleck. The idea of the game was to collect inkblot cards that could be bought from local shops and make associations and stories from the inkblots. Rorschach went on to study psychiatry and while training, in 1918, he noticed that patients diagnosed with schizophrenia made radically different associations to the Klecksographie inkblots than did normal people. He therefore developed the Rorschach test as a diagnostic tool for schizophrenia. It wasn't until 1939 that the test was used as a projective test of personality. Rorschach himself had always been sceptical about this. This controversy about the reliability and validity of the Rorschach has been present since its conception. Today, many - probably most - psychologists in the UK think the Rorschach is nonsense. First, some psychologists have argued that the testing psychologist also projects his or her unconscious world on to the inkblots when interpreting responses. For example, if the person being tested sees a bra, a male psychologist might classify this as a sexual response, whereas a female psychologist may classify it as clothing. Second, the Rorschach has also been criticised for its validity. In other words, is it measuring what it says it is measuring? Rorschach was clear that his test measured disordered thinking (as found in schizophrenia) and this has never been disputed. But whether it accurately measures personality as well is up for debate. Finally, critics have suggested that the Rorschach lacks reliability. Two different testers might come up with two different personality profiles for the same person. I am also sceptical about the scientific validity of the Rorschach. But I do think it is a useful tool in therapy and coaching as a way of encouraging self-reflection and starting a conversation about the person's internal world. Samantha is a 28-year-old lawyer. She is happily married and has recently discovered she is pregnant. She and her husband had been trying to conceive for the past year. I used the Rorschach as part of a leadership coaching programme with her. To give you a flavour of the Rorschach in practice, here are her responses to this card. "It's two people facing each other. You can see their heads, arms and legs spread out. (1) There is a big cooking pot between them. They are stirring the cooking pot, making food. (2) The thing in the middle is like two hearts - maybe it's meant to show that they are in love? "(2) The red thing in the middle looks like a butterfly. I know it's silly - and probably because I'm pregnant, but the (3) red things on each side look like newborn babies with the umbilical cords still attached. When I think of that, the (4) two people could be a mummy and daddy holding a Moses basket or cot. Look, you can see the blanket round the side. "(2) The red in the middle is their two hearts joined and is the baby. (1) They could be fighting for the baby, like a tug-of-war with the cot. That reminds me of work, which I haven't thought about for ages. Parents divorcing and fighting over the children. God forbid that would happen to me." The "inkblot" style has been used in promotional London Underground maps and to advertise US drama Dexter. Samantha is a well-adjusted, confident and successful woman who is experiencing a particularly happy period in her life. It is clear to see how she projects the themes of her current life on to the inkblot. There is a strong theme of partnership and attachment. The two people making something ("stirring the cooking pot"), alludes to Samantha's pregnancy. This theme is then reinforced ("the red things on each side look like new-born babies with the umbilical cords still attached"), and then instantiated ("the two people could be a mummy and daddy holding a Moses basket or cot"). Anxiety is the opposing emotion to joy in Samantha's emotional dynamic. Worries about future conflict with her partner intrude into her narrative ("they could be fighting for the baby, like a tug-of-war with the cot"). This is only a snapshot. There were many other things in Samantha's Rorschach that opened the doors to how her internal psychological world impacted on her life at home and work.